Here’s an admission you won’t come across on just any gaming blog: I love fruity games. Now, when I say “fruity games,” I’m not talking about Captain Rainbow or Cho Aniki; I’m talking about games that are packed with so much actual fruit they should accompany every Edible Arrangements® order. Bubble Bobble--My favorite moment in this Fukio Mitsuji-designed quarter-muncher occurs when I defeat the last enemy and a giant piece of fruit (or some other food item) drops from the top of the screen. Why can't every level end this way? 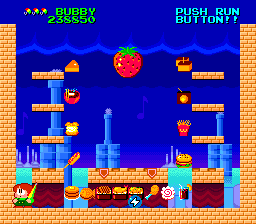 Coryoon--This crazy PC Engine cute ‘em up would be well worth the price of admission even if fruit didn’t pop out of defeated enemies like they were the world’s healthiest piñatas (see screenshot above) thanks to its crisp, colorful graphics, cheerful music and tight controls. Plus, it stars a baby dragon! Don Doko Don--Sure, this Taito-developed title has nothing on the fruity games that seemingly inspired it (namely Bubble Bobble and Rainbow Islands), but that hardly means it's bad. In fact, it's pretty darn good--especially if you like hammer-wielding dwarves. Monster Lair--Is there anything more satisfying than coming across certain pieces of fruit in this game (above) and then shooting them until they erupt into even more pieces of fruit? OK, so I’m sure there are many more satisfying experiences in all of video game-dom, but I’m not sure there are in this particular title. 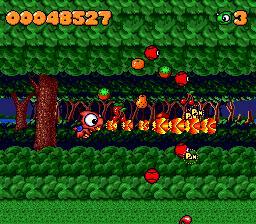 The New Zealand Story--I have to admit, the fruit in Taito’s cute-but-challenging platformer (see screenshot below) pales in comparison to its cool bosses, inflatable ducks and laser guns. Still, the apples, grapes and melons (no, not those kinds of melons) eradicated enemies leave behind serve to make this already sweet game even sweeter. Pac-Man--The arcade classic that prompted my semi-obsession (is there such a thing?) with fruity games. Why does the titular Pac-Man collect fruit? I have no idea, although I imagine the answer to that question makes about as much sense as the answer to this one: "Why does he chase ghosts?" Parasol Stars--Like its predecessors, Bubble Bobble and Rainbow Islands, Parasol Stars (below) throws more than just fruit at players; it throws jewelry, pastries and vegetables at them, too. Is that more enticing and exciting than the title’s frantic gameplay? Actually, sometimes it is. Rainbow Islands--What does Rainbow Islands offer gamers that Parasol Stars doesn’t? Rainbows, for starters. Oh, and stars! That’s not to say it’s a prissy pushover--in fact, it packs quite a punch in terms of bosses, enemies and levels. Just think of the fruit--and treats and veggies--you collect along the way as sweet rewards for your troubles. Yoshi's Story--I know this fruit-filled platformer gets a lot of hate (probably because it pales in comparison to its predecessor, the amazing Yoshi's Island), but I've always had a bit of a weakness for it--and its (admittedly saccharine) theme song. Note: This post was adapted from one that originally appeared on my other gaming blog, iwasateenagepcenginefan.wordpress.com. Coryoon is on the top of my "to buy"-list for PC Engine! It looks soooo sooo sweet! Me, too, Starfighter. If only it weren't so damn expensive! I swear, even 'loose' copies on eBay go for about $80 or $90. Yikes! Taito seems obsessed with fruit. But...one game is missing from this list. KATAMARI DAMACY! You pick up so much fruit in that game...pineapple, melon, cherries...you name it. There's even a level that starts with a trail of bananas, and as you pick them up, the King of All Cosmos says Ba, then Na, then Na, and Na and NA...until you miss one. It's pretty great. Oh! I *knew* I had missed a few important ones, but I couldn't think of them :( Anyway, GREAT catch, Justin!